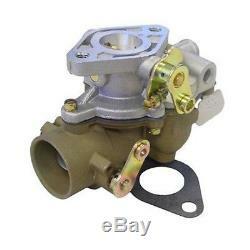 One New Aftermarket Replacement Zenith Carburetor for. Allis Chalmers Tractor Models: B, IB, C, CA (1952-56), D10, D12. Case Models: VA (1942-56), V, VAC, VC, VAI, VAS, VAO, VAH, SC, SI, SO. IH / Farmall Models: A, AV, B, BN, C, Super A, Super C, 100, 130, 140, 200, 230, 240, 330, 340,500 Crawler, I- 340, F- 404 and I- 404 Crawlers: T340, T4 Crawler, T5, Windrower U-2, 201. John Deere Models: L (sn L640000 and up), LA, LI --- Power units: LUC --- Combines: 12A, 25, 30. Massey Ferguson Models: TO20, 30, 81, 82, 101 JR. 102 Jr, F-162 Continental engines, 60 PT Combine. Minneapolis Moline Models: BF, BFH, BG, R-RT (1945-52), RT (1939-48), RTI. Oliver Models: 15 Grain Master, 35SP Combine, HG, OC-3, 44, 60, 66, 70, 77 IXB-3 Hercules engine, 15 Grain Master, 35SP Combine. Carb MFG: Marvel Schebler: TSX21, TSX28, TSX30, TSX34, TSX36, TSX42, TSX43, TSX55, TSX60, TSX69, TSX74, TSX88, TSX90, TSX114, TSX120, TSX138, TSX154, TSX155, TSX156, TSX157, TSX159, TSX171, TSX186, TSX188, TSX198, TSX212, TSX231, TSX248, TSX253, TSX272, TSX287, TSX305, TSX308, TSX309, TSX312, TSX333, TSX346, TSX347, TSX348, TSX359, TSX361, TSX361A, TSX363, TSX380, TSX400, TSX403, TSX405, TSX406, TSX418, TSX421, TSX422, TSX447, TSX470, TSX474, TSX472, TSX486, TSX507, TSX513, TSX541, TSX606, TSX665, TSX668, TSX670, TSX701, TSX730, TSX744, TSX748, TSX809, TSX815, TSX827, TSX860, TSX926 --- ZENITH: 3199, 9705, 9706, 9707, 9749, 9752, 9797, 9804, 10514, 11115, 11141, 11142, 12115, 12122, 12225, 12285, 12401, 12475, 12522, 12566, 12262, 12749, 12773, 12911, 14544, 16232 Details. Carburetor mounting studs measure 2-3/8 center to center (Because of the smaller dia studs that are included). Throttle body throat size measures 1 diameter. Choke air horn (air inlet) measures 1-5/8 O. The fuel inlet is 1/8 NPT. The carb mounting flange gasket is included. Replaces Part Numbers: 9749, 52499DB, 69401D, 69404D, 352047R91, 372985R92, 69402D, 377600R91, 52499DC, 52499DE, 375560R91, 52499DD Related: 3454892R92, 352377R92, 354184R93, 354185R92, 354892R91, 354892R92, 354892R93, 355485R91, 355485R92, 356901R91, 356902R92, 362384R91, 362385R91, 366306R91, 366306R92, 366306R93, 366462R94, 372098R93, 372983R91, 373957R91. Our processing system is automated. Thank you for your continued patronage. We carry parts for Engines, Transmissions, Front & Rear Axles, Hitch & Drawbars, Undercarriages, Final Drives, Seats, Bearings, Cups, Cones, Seals, Discs, Couplers, Gears, Brakes, Pressure Plates, Pilot & Throw Out Bearings, Ring & Pinions, Gaskets, Decals and MORE for most high wear items. We also carry replacement parts for the Boom Cylinder (Seal Kits, Tubes, Glands, Pistons, Rods). The item "Zenith Carburetor for Avery Allis Chalmers John Deere Massey Oliver Minneapolis" is in sale since Wednesday, August 17, 2016.